Check out how many calories in Greek Chicken Salad with Dijon Vinaigrette. Get answers to all your nutrition facts questions at FitClick. Description: Grilled chicken, feta cheese and tomatoes over spinach tossed in Dijon vinaigrette. Tip: For nutritional information on all the ingredients in Greek Chicken Salad with Dijon Vinaigrette just click on each ingredient name. Then adjust the serving size for any Greek Chicken Salad with Dijon Vinaigrette ingredient with the serving size tool in the nutrition facts area to the right to see how you can save calories, carbs and more. 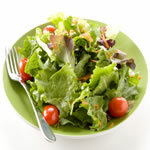 Combine spinach, lettuce, tomatoes, and chicken in large bowl and set aside. On very low heat, add mustard and vinegar to pan. Whisk together until smooth. Add water and whisk. Add feta cheese. Increase heat until heated throughout, but do not boil. Add small amount of dressing to coat greens. Find more recipes like Greek Chicken Salad with Dijon Vinaigrette. FitClick has over 60,000 foods and recipes with detailed nutrition information to view.